With the end approaching of my MA course at Bath Spa University, I have been working quite hard to finish pieces for the show. Therefore it was with a mixture of delight and anxiety that I saw that the Tour of Britain Cycle race would be finishing in Bristol one day, and later starting off from Bath. I was excited because, as a keen cyclist, I enjoy watching the spectacle of live events like this, but I was also nervous about taking time away from the studio. In the end, I saw the race climb Bridge Valley Road in Bristol, just a couple of kilometres before the finish in Bristol and then later in the week I watched the race head off from Victoria Park in Bath, just a few minutes down the road from my University. 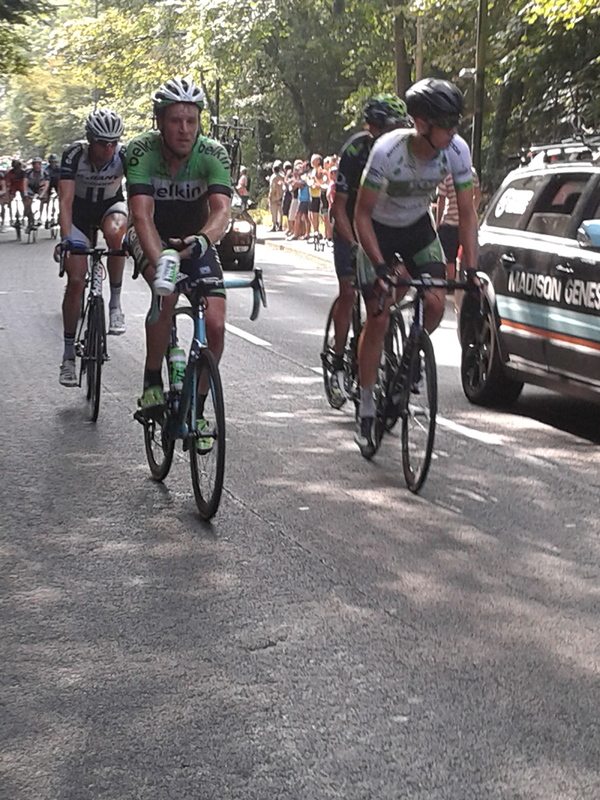 Watching the riders in Bristol was very special for me as I love training up Bridge Valley Road. As a 16 year-old rider I would do circuits up this hill with my Bristol Road Club club mates. We would absolutely tear up the hill, racing each other over the top. I knew if I could go flat out up the hill in a 42×17 gear, and recover by the time I reached Bristol Zoo, I would be race-ready. So it was a real thrill to watch the race pass by. The leaders were absolutely flying, others near the back were going more slowly and seemed glad to be near the finish. I was lucky enough to get a bidon from a Belkin rider who jettisoned his water bottle while passing me. At Bath, I was able to watch riders arrive in their team buses and cars, ride to the signing on/presentation area and generally enjoy the carnival atmosphere. Groups of enthusiastic local school children lined the opening circuit which took in Bath’s famous Crescent, a row of magnificent houses arranged in a curve behind a cobbled road that overlooks Victoria Park. Within the park, it was fun to see the teams arrive and unload their bikes ready for the off. I do enjoy the beauty of the bicycle, with its simple elegance and colourful possibilities. Many fans (including myself) were busy photographing the bikes lined up for use and hoping to glimpse the riders before the day’s stage (Photo gallery to follow). 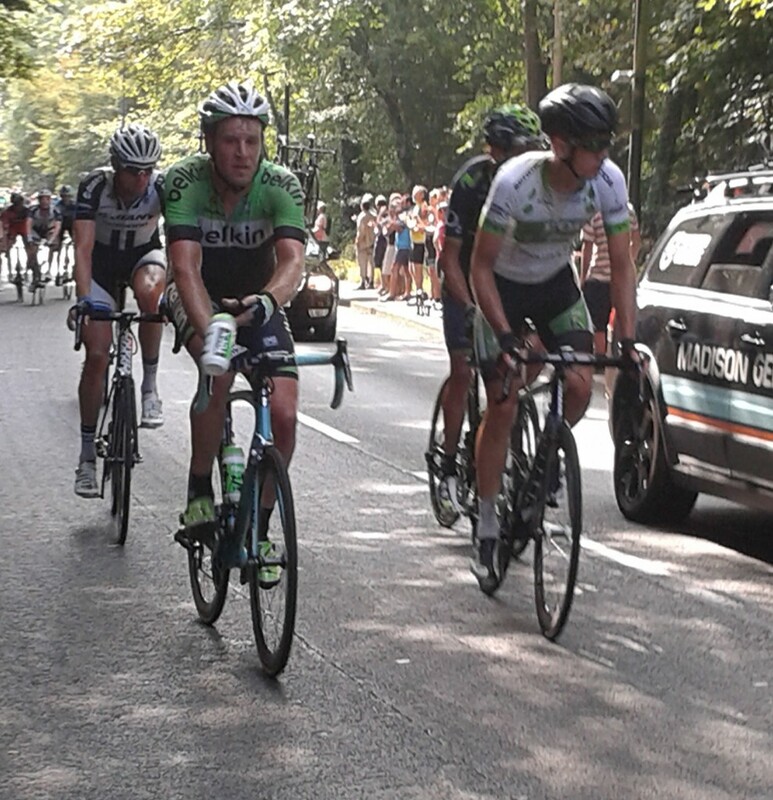 This entry was posted in Hors Category and tagged Bath Spa University, Team Belkin, Tour of Britain by vilas. Bookmark the permalink.